Tokyo is an incredible city that’s jam-packed with things to see and do, most of which you’ll never find on this side of the globe. From cat cafes to hidden absinthe bars, world class ramen to cutting-edge art, it’s a whirlwind that’s going to steal your heart, stuff it full of sashimi, douse it in top-shelf whisky, and then take it to a karaoke bar where it’ll sing Cranberries covers all night long… Or maybe that’s just me. We’re not going to lie: trying to get around Tokyo in 48-ish hours is damn near impossible, but this guide gives you a slice of our own personal favourite bits of Japan’s big smoke. Check into the Shibuya Granbell Hotel. It might be in the centre of one of the busiest junctions in the world, but you’ll want to be riiiight in the middle of the action in a city that’s as colourful as Tokyo. Literally dump your bags then hot-foot it out the door! Shibuya is a melting pot of Japanese culture, so the best thing to do to work up your appetite is cruise around its streets, dabbling in retail therapy. Take a walk through its busy cross streets, then follow the Fukutoshin line to Jingumae, where you’ll find some epic shops. Laforet Harajuku is the perfect place to dive head-first into Tokyo pop culture, and accidentally buy a $800 pair of sneakers. 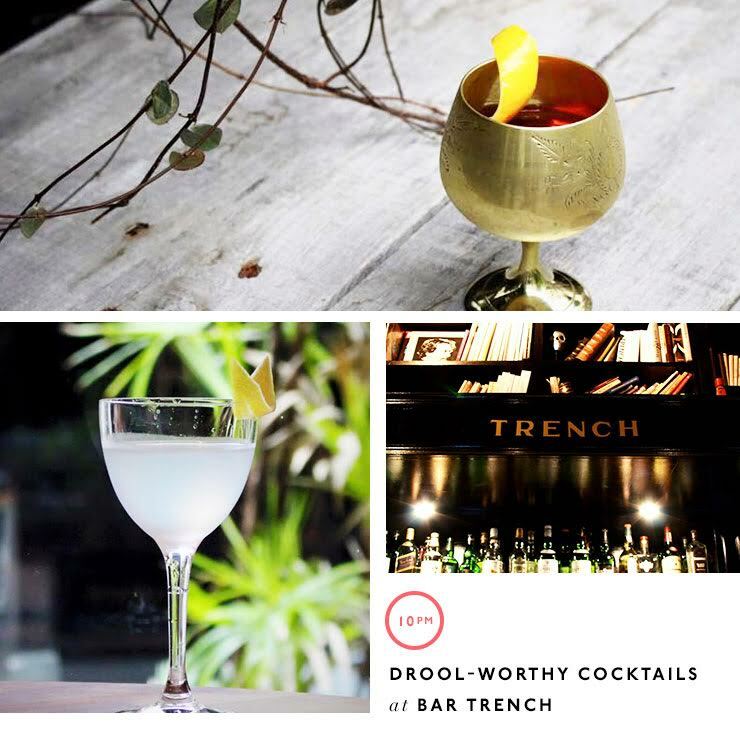 Bar Trench! A stone’s throw from Ebisu station lies one of Tokyo’s most incredible cocktail bars, where you can expect only the best in cutting-edge drinks, albeit with an olde-worlde European twist (no, we don’t know why either). You’ll want to get there no later than around 10pm to make sure you snag a seat, and make sure you try at least two concoctions made from some of the rarest bottlings in the city. If you’re keen to check out the mega-club scene in Tokyo, Womb is where it’s at. Expect big name DJs, incredible light shows and a very, very sore head the next morning. What, you didn’t go to Womb?! If you’re up with the birds, grab a cold drip from About Lifecoffee Brewers, or head to the top floor of Tokyu Hands, one of the most comprehensive ‘they have everything’ stores we’ve ever been in (Hardware! Cosmetics! Handbags for smartphones! ), then jump on a train and get yourself to Roppongi for some culture. The Mori Art Museum, situated on the 53rd floor of Roppongi Hills, is one of the best galleries in the world, and comes complete with skyline views thanks to the Sky Deck, situated a few floors above it. Check out fascinating local and international artworks, and be sure to stop in at the cafe, which is often themed around the main art show, for a coffee before leaving. If art is your thing, head from here to 21_21 Design Sight, a gallery co-founded by Japanese fashion designer Issey Miyake, for more art in a smaller, perfectly formed space. Ready for some more sushi? Jump on a train and get yourself to Akihabara, the ‘geek’ area of Tokyo, for a speedy feed at Nadeshiko Sushi—an entirely female-run sushi bar. Finish your bento box and make sure you get some coins in your change for your next pit-stop. 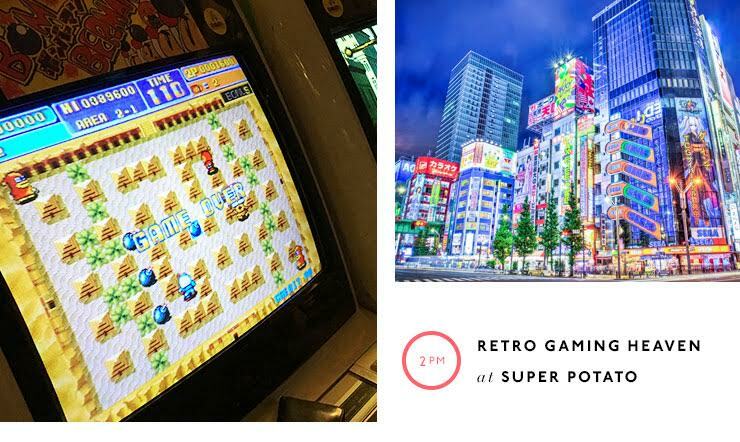 Whether you’re a gamer or not, you can’t walk past Akihabara’s Super Potato, one of the most famous retro gaming venues in the world. These guys sell 20¢ candies, reconditioned Nintendos, all the Poemon merch you could ever dream of, AND have a fully functioning arcade. We dare you not to have fun! If you’re feeling tired out, what you REALLY need is some quality time with a harem of cats, right? Calico Cat Café in Shinjuku is one of the most central cat cafes in the city, and the staff are friendly even though the language barrier can be a little tricky. Check your shoes and coat at the door, buy a bowl of kitty treats, and get ready for some feline cuddles. There are heaps of insane themed cafes in Shinjuku, so if cats aren’t your thing, you’re bound to find an alternative. Like the Gothic cathedral café, Christon Café? There are a million things to see and do in Shinjuku, including the Isetan department store, a heap of second-hand clothes stores, and some cute cafes (4/4 Seasons is our favourite! ), but an absolute must-not-miss is Golden Gai, a tiny laneway network of bars. You’ll be charged door tax upon entering, which covers some snacks and on occasions, your first drink. There’s everything from country music bars to rock’n’roll bars to Cremaster, a reeeeeeaally intense art bar. 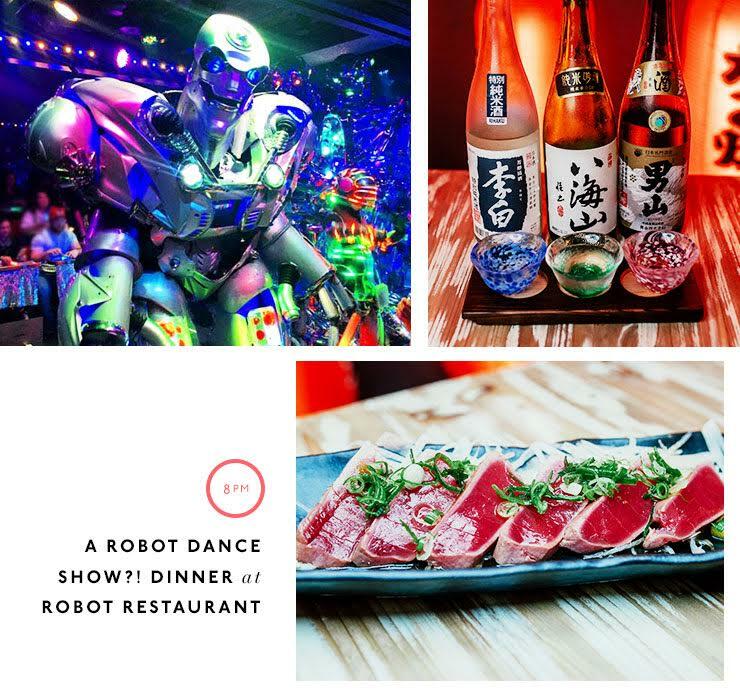 Okay, so Robot Restaurant—a restaurant that incorporates choreographed dances by larger-than-life Transformer-esque robost—might be a bit gimmicky, but if you’ve only got 48 hours, you have to do it. Book in advance, and bring your camera! Hidden bars are where it’s at, and Ben Fiddich, the best absinthe and gin bar in Tokyo, is definitely that. Situated on the 9th floor of the Yamatoya Building, Shinjuku, it’s a bugger to find but the hand-blended botanicals that go into every drink make it 100% worth it. Omotesando district’s Bunbougu Cafe is yet another themed gem. Selling only the cutest stationery in the country (hint: buy all your souvenirs here), you buy your writing goods on the way in, then enjoy a traditional Japanese breakfast while doodling away. Bliss. Michelin star ramen venue Tsuta in Sugamo is a little train ride out from the park, but their bowls of goodness are 100% worth it. We know you’ve only just had breakfast, but you need to get to this one early to ensure you get a bowlful of world-class noodles. And, if you're a ramen fan, check out Ramen Adventures for ramen recommendations all over the city! 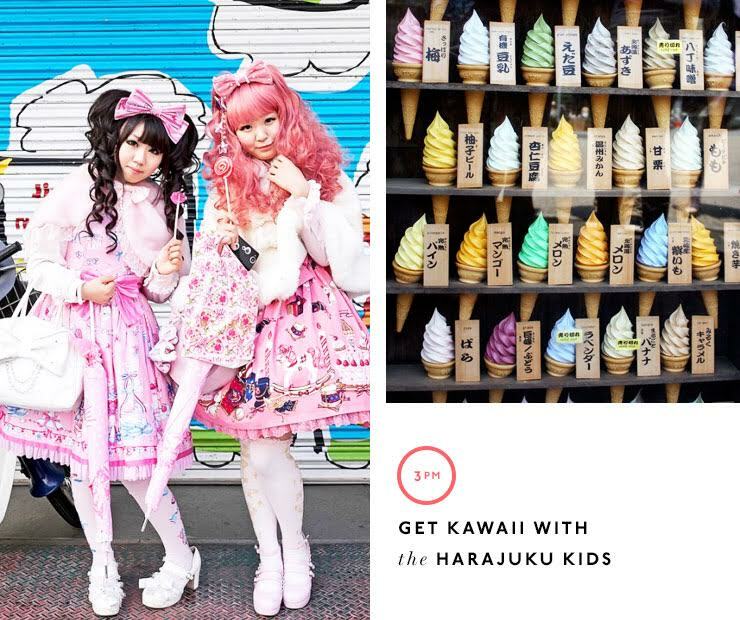 Mixing up the old with the new, Harajuku comes to life on Sunday afternoons when goth lolitas, super kawaii fans and, um, people who just really, really love dressing up their dogs come out to play. Take a stroll around the district and its neighbouring Yoyogi park—it’s people-watching heaven. Rokkasen restaurant in Shinjuku is not cheap, but the beef and various hotpots here are the best in the city, so if you’re going to break the bank on something that isn’t sushi, this should be your dining spot of choice. Get to Shinjuku train station early (so early, in fact, that your flight is the next morning…), and sneak in a whisky at Zoetrope. There’s no way to sum up this bar: Imagine a whisky dive run by a film buff who’s a cross between The Big Lebowski’s ‘The Dude’ and Fear and Loathing’s Roaul Duke, and you’re part way there. It’s karaoke time. Shidax is the epitome of Tokyo karaoke bars—epic views from floor-to-ceiling windows, all you can drink specials, and every pop classic from the past 50 years. This is your moment. Pick up a Pasmo travel card as soon as you get there—it will get you onto pretty much every train in the city. Make sure your hotel or Airbnb provides a portable wifi device, so you can connect to wifi while on the go! Say your pleases and thank-you's: 'Onegaishimasu' and 'Arigatou'. Always pay for cash items using the cash tray—put your money in the tray, and pick up your change out of the tray, rather than handing anything directly to the cashier.